Linking critical legal thinking to constitutional scholarship and a practical tradition of US lawyering that is orientated around anti-poverty activism, this book offers an original, revisionist account of contemporary jurisprudence, legal theory and legal activism. The book argues that we need to think in terms of a much broader inheritance for critical legal thinking that derives from the social ethics of the progressive era, new left understandings of "creative democracy" and radical theology. To this end, it puts jurisprudence and legal theory in touch with recent scholarship on the American left and, indeed, with attempts to recover the legacies of progressive era thinking, the civil rights struggle and the Great Society. 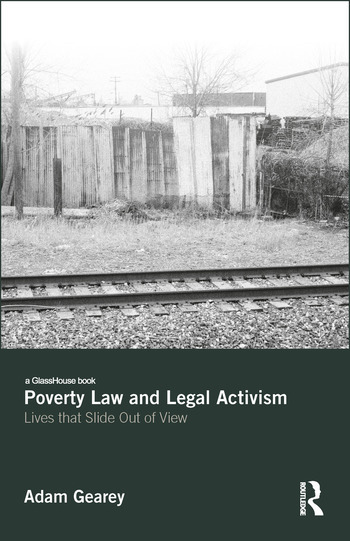 Focusing on the theory and practice of poverty law in the period stretching from the mid-1960s to the present day, the book argues that at the heart of both critical and liberal thinking is an understanding of the lawyer as an ethical actor: inspired by faith or politics to appreciate the potential and limits of law in the struggle against economic inequality. Adam Gearey’s marvelous new book is a leading entry in a new and emerging field of critical legal scholarship that speaks from the heart about one of the most important questions in all legal studies: how is it possible to live an ethical life in the law? Gearey’s decision to tell the story of 60s poverty lawyers in America, including the roads not taken by them (and subsequently barricaded by politics) is brilliant. But this is not just an American story, for there are universal lessons to be drawn from the journey that the author describes. The book will strike a chord for readers eager to hear more about actually being a progressive member of the legal profession. Louis Wolcher, Professor Emeritus, Charles I. Stone Professor of Law, University of Washington School of Law. At a time of burgeoning inequality, intensified threat to democratic inclusivity, and renewed neoliberal assault on the welfare state, Lives That Slide Out of View refocuses attention on poverty and "poverty law" through the lens of critical theory and practice. Surveying diverse strands of the progressive response to poverty in the United States over the past several decades, Gearey draws novel connections, surfaces contradictions in the deployment of law for social change and offers a wide-ranging analysis of a field that defies easy categorization. A timely and thought-provoking study at a critical moment in the struggle for social and economic justice. Lives That Slide Out of View is really a magnificent piece of work, a true excavation and scholarly assessment that traces the tendrils of poverty law and CLS; in essence a return to what used to travel under the name of existential Marxism; but broadened through Buber and Christian radicalism to become a bricolage of humanism, poetry, music and theory. These modes of self-recognition in others suggest the possibility of overcoming alienation, degradation, pure poverty and pain.